An independent herding dog that can round up livestock without a shepherd, the Huntaway is a very smart and reliable canine helper. It is even-tempered and highly adaptable, able to live in the home and in the farm. Affectionate and good with children, this breed also is a suitable choice for first-time dog owners, aside from families. 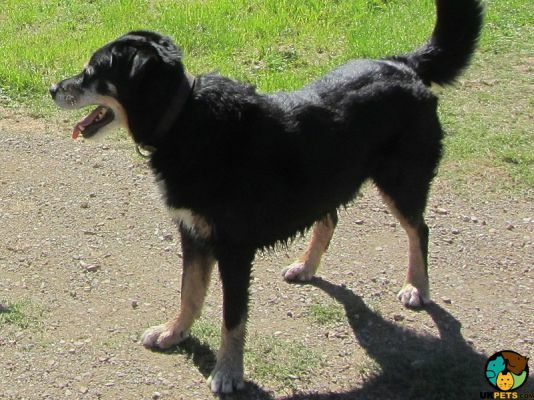 The origin of the Huntaway, also known as the New Zealand Sheepdog, is hazy. What is certain, though, is that it is native to New Zealand. It is the favoured canine for driving huge masses of sheep in the country. The NZ Huntaway was developed in response to the different demands of herding livestock across the nation’s high country stations. Earlier canines—British sheepdogs—tended to drive the sheep silently. However, sometimes it would bark at the herd—a characteristic that NZ farmers find desirable in the hilly terrain of the countryside. Sight-driven dogs would be less effective in such terrain as it may lose sight of the herd as it treads down inclines. As such, shepherds got into breeding the ideal canine herder. It should be able to manage bigger flocks, which were too large for Collies, and have a lot of stamina. It also should not rely on sight herding. The Huntaway later emerged. 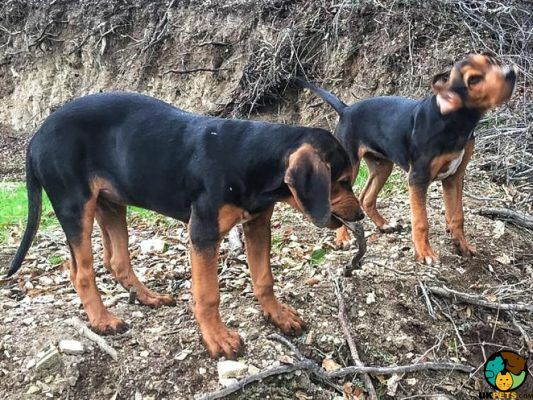 It has been said that the Rottweiler, Beauceron, Labrador, Bloodhound, and German Shepherd were added to the Huntaway mix. This is difficult to confirm as this breed’s development was not documented. However, the Huntaway dog is said to have existed at least a century ago. This pooch got its name from the herding trial that this type of dog was usually brought to by its handlers. To this day, it has not yet been acknowledged as a distinct breed. 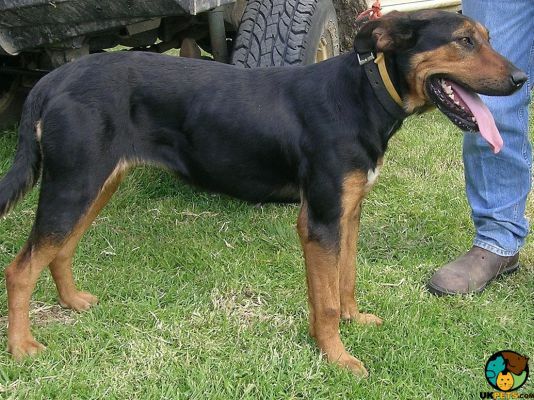 Despite this, the Huntaway has gained popularity among farmers in various parts of the world. The NZ Sheepdog’s height, on average, ranges from 56 to 66 cm at the withers. Its weight ranges from 25-40 kg. Its head is broad but proportionate to the rest of its body. Moderately wide, its ears are situated on top of its head and are carried back when sedentary. Its cheeks are not prominent or full and its muzzle is quite long but tapers to the nose. Its eyes, intelligent and keen, are medium-sized and positioned obliquely on its face. The eyes are rather almond-shaped and brown. The Huntaway’s neck is very strong and muscular, as well as its body and legs. It has a deep chest, from which its characteristic booming bark is produced. Its tail is moderately long. Its paws are well padded and oval in shape. This dog’s coat can be short, medium, or long in length. The fur may be glossy or rough to the touch. The coat usually comes in tricolour or black and tan colour combinations. Generally, its coat is easy to maintain as it only needs to be brushed once or twice every week. It sheds moderately, especially in the spring and autumn seasons. The Huntaway is renowned for its balanced temperament, loyalty, and kind demeanour. True to its trustworthy nature, it has been dubbed by some as “all bark and no bite”. This breed is the kind that thrives on being given something to do. It has deep stores of stamina and energy, as well as a keen intelligence, in that it needs to be stimulated a lot. Otherwise, it can engage in undesirable pet behaviours just to occupy and amuse itself. Nevertheless, the Huntaway can work independently reliably. Despite being bred for herding and farm work, this canine is adaptable enough to enjoy human companionship in the home. It is so good natured that it will greet strangers and gets along with children. As such, it does not make a very good guard dog. First-time owners may find this canine a suitable pet, as long as they can fulfil its need for tremendous daily physical and mental stimulation. Follow a set feeding schedule consistently, and provide the same food your Huntaway is used to in order to avoid gastric problems. However, if you need to shift to another type of high-quality food, do so gradually. This helps your pet adjust accordingly without complications. Puppies must be fed 3-4 times a day whilst adult ones can be fed twice a day. For a puppy 2-6 months old, feed it 210-400 g of food daily, depending also on its size and activity level. For one that is 8-10 months old, feed it 230-365 g of food daily. When it turns 12 months and beyond, it can be fed adult food. The adult Cardigan weighing 25 kg should be fed about 250-320 g of food daily, also taking into consideration its activity level. For those 30 kg and above, the daily recommended portion ranges from 295-420 g.
As a high energy and intelligent dog, the Huntaway should be exercised for at least an hour every day. It should be allowed to go off lead, provided it is in a securely fenced yard. Huntaway puppies are not commonplace in the UK. You will need to register your interest among breeders and be put on a waitlist. When one is finally available, it may set you back at least £500. Insurance may cost about £24 (basic) to £44 (lifetime) monthly. The food cost is estimated at £40-£50 monthly. For vaccinations, boosters, annual checks and other veterinary costs, pet care expenses may add up to more than £1,200 annually. On average, a Huntaway owner will spend about £60-£110 per month. The insurance fees can also affect these cost estimates. For its lifetime (12-14 years), the costs can range from £8,640 to £18,480 overall. This estimate does not include the expenses incurred in buying a puppy yet. 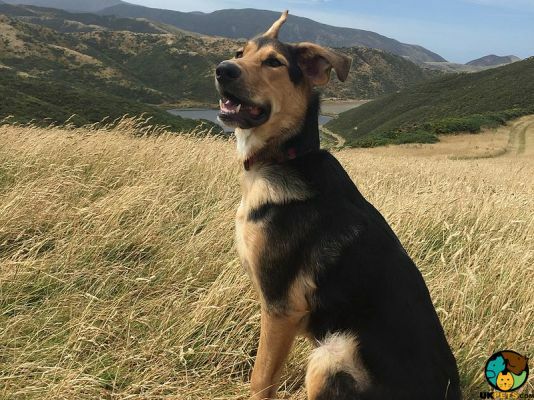 Is a Huntaway Right for You? This canine is even-tempered, kind, and adaptable, making it an ideal family pet. It is very intelligent and active, thus requiring much exercise and mental stimulation. The Huntaway’s coat is generally low maintenance. It has a high prey drive and a very strong herding instinct. Although this dog can live in a home, it is not suitable for apartment living. This pooch is also a good choice for first-time owners provided its exercise and mental stimulation needs are met.